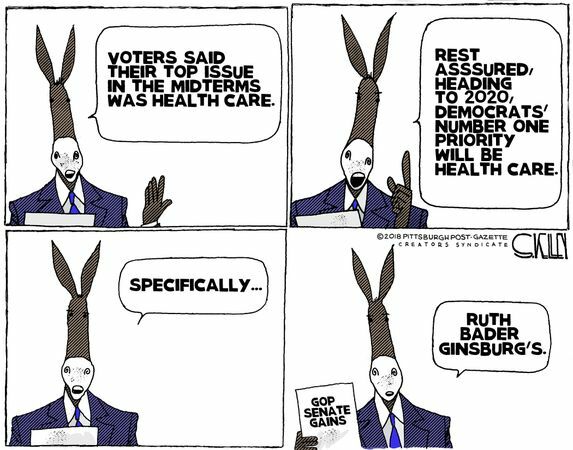 Ginsberg Falls, Has Three Broken Ribs! This may be the beginning of the end for her. At her age, it's entirely possible that she "might" wind up with pneumonia as a result of this and that's what kills more old ppl than anything else. Supreme Court Justice Ruth Bader Ginsburg has been taken to the George Washington University hospital in Washington, D.C. Thursday for "observation and treatment" after taking a fall in court Wednesday night. She has reportedly broken three of her ribs. Re: Ginsberg Falls, Has Three Broken Ribs! Looks like the beginning of the end for Ruth. This is what usually happens to old people. The fall, break a hip or ribs in this case and it all goes down hill from there. She needs to retire. whats wrong with you sick liberal trolls. absolutely nobody said they want to see her die. you are a sick twisted person. These effed up Trump-trolls are indeed a twisted bunch. Lil' trollboy will say anything to get a rise out of people. Sicko #2 just arrived right on time! Or threw her down and jumped on her, that's more his style I hear. Looks like another replacement coming soon. He needs to choose a woman though, that will at least keep all the former blasy fords out of the equation. Can see it now more cartoon's from the demon rats.